The International Cocoa Organization is pleased to announce that the greatly expanded and improved World Cocoa Directory 2015/2016 is now available in printed and online editions. The new edition of the Directory, last published in 2013, now contains over 4,100 entries, including 1,400 new entries and 1,300 amendments, to provide the most up-to-date guide to cocoa and chocolate companies and organizations worldwide. Reflecting both the Organization's comprehensive connections within the cocoa and chocolate industry, and a great deal of thorough research, the new Directory includes full contact details as well as indexes based on both geography and activity category for the thousands of organizations included. As a unique reference work, the World Cocoa Directory 2015/16 has also been expanded with over 20 reference articles produced by experts and covering all aspects of the cocoa and chocolate business. In this section, you can find the latest details of the world cocoa market, what is currently affecting it and the way it is likely to develop in the coming season; the current trends in the global chocolate market; a look at the Dominican Republic, venue for the third World Cocoa Conference in 2016, through the eyes of one of its most important cocoa suppliers; a guide to risk protection on the current futures markets; cocoa's role in Papua New Guinea; a review of some of the latest cocoa processing and quality control methods; an informed guide to handling cocoa beans and powder in plant; and a report on the developments in the growing and increasingly sought-after fine or flavour cocoa sector, among other in-depth editorial material. 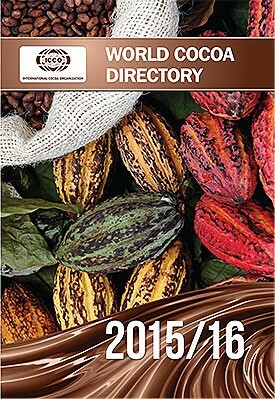 The printed edition of the World Cocoa Directory 2015/2016 is very easy to use, with a traditional alphabetical listing and two indexes (by country and by activity category) and as such is the ideal tool to facilitate contact business contacts and opportunities and present a fascinating 360 degree view of the world's cocoa and chocolate industry. This version comes in a hand-bound, hard cover edition, with clear text on hard-wearing silk paper, and very much a luxury item at £285 per copy, which includes express courier charges worldwide. The online version, to be updated on a regular basis, is available only in combination with the printed version for only £395. This version will be accessible via a password provided by the ICCO, specific to a particular company or organization and can be shared within the same location. The user will have access to the entire Directory database via the fully searchable online version, with full cross referencing by geography, activity category and keyword. To receive your copy, and to get your password for the online version, click here to download, complete and return the attached order form by email or fax.